CELEBRATIONS TIME ON YOODLEEYOO.COM – IT IS KISHORE’S BIRTHDAY!! 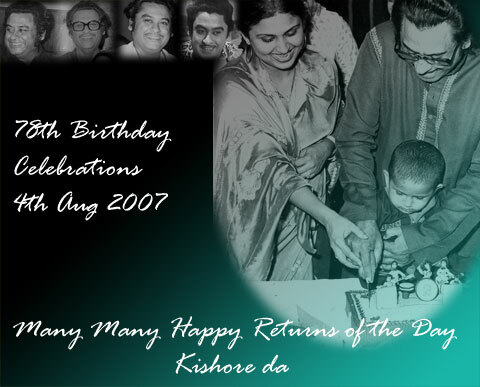 All KK fans join together to celebrate at Yoodleeyoo.com the 78th Birthday of our Legend Kishore Kumar. You live forever with us in your music..
Two lovely write ups by our two esteemed KK fans Madhavi and Eskayes. 2. Kishore – The Extraordinaire – Eskayes etches out beautifully the birth of the legend and how he carved a special niche for himself in bollywood films and hindi film music and continues to reign even to this day. 7.00 P.M. Fun and frolic – who else could give us but our own Kishore. 8.00 P.M. Live Show songs – plenty and bounty – The Performer at his best. 9.00 P.M. Khandwa Live – We bring this audio delight once again after many years. Our special thanks to Srinivas Gattu – the source for this rare treat. Harihar and Dj Don join in offering their musical tribute on the Yoodleeyoo Radio. Video clips from movies – a journey of fun and comedy – Kishore the splendid artiste. Our special thanks to Subir Biswas – who offered great pictures of fantastic quality and Espari Qader, a great fan of Kishore Kumar, and a singer himself – for the Kishore Live program. This entry was posted on Saturday, August 4th, 2007 at 9:10 am	and is filed under Specials. You can follow any responses to this entry through the RSS 2.0 feed. You can skip to the end and leave a response. Pinging is currently not allowed. Kishoreda is the biggest source of inspiration to new singers,he is the greatest,king of kings,boss of bosses.Wishing this versatile genius a happy birthday.He is immortal. Kishoreji is GOD.Really he is still the most popular artist of all times,ruling the hearts of billions of people all over the world.He is idol.Happy birthday to him.Kishore Kumar is the most brilliant phenomenon to ever happen in the universe. Thanks to the one who did it. I was a great fan of Kishore because His voice was my friend too. I think Kishore Kumar is the best thing to happen ever in the universe,in the world of talent.My tribute to him. JAI SHRI MAHAGURU KISHOREDA BHAGWAN KI!!! KISHORE KUMAR IS IMMORTAL,GOD,EVERYONE’S MAHAGURU. I HAVE DEDICATED MY ENTIRE LIFE TO KISHOREJI. You will remain in our heart till the last date of our life. happy birthday , wherever you are i hope you are in peace ….we’ll always miss you !! A very happy birthday to you. Who says you are no longer with us. I can feel your spiritual presence whenever I sing especially your numbers. You are my spiritual guru. I sing your number to my baby son, “Aa chal ke tujhe mai le ke chalon..”. Wo phir nahi atay,woh phir nahi atay. Who is that beautiful woman next to Kishore? I don’t think that was Leena. Anyway, stop insulting Kishore Kumar by calling him a God. God is not one of my favorite singers (he’s too perfect) but Kishore Kumar is. Kishore Kumar was great enough as he was (no need to paint something else and DISTORT him wrongly) and we all LOVE him for it. He’ll never be dead so long as the fans remember him and the everlasting voice will be enjoyed by music lovers for many decades to come. KishoreDa IS truly the most talented, the most brilliant and the most touching singer ever to be born on this earth. People like KishoreDa are born PERHAPS in a millennium. Hats off to KishoreDa for his unparalleled singing on his 78th birthday. KishoreDa you will never be away from us and no one will be born again like you because you will be always alive in Indians. Kishore kumar is a not only No.1 singer .he is the ideal for all new comer singer like , kumar sanu, abhijeet, babul suprio, vindod rathod. Kishore Kumar is the passion of my life. Yes ofcourse Kishoreda is the best.He is extraordinary in every form of art,he is the true genius.Long live Kishoreda!!! To listen anyone else except rafi is just waiting of time rafi is the powerhouse of tallents and rest are the points (switches). To listen anyone except Kishoreda is wasting of time.Kishoreda is the king of music,rest are all mediocres. Life withut Kishore Kumar is impossible.Kishore Kumar is every singer’s inspiration.He is the greatest in every field.A great salute to the boss. I AM GREAT FAN OF KISHORE KUMAR…..
KISHORE IS THE BEST BEFORE ALL SINGERS………..
Kishore Kumar’s voice is mesmerizing, magnetic, enthralling, intriguing, fascinating, larger-than-life !!!!!! I could go on all day and night….Yet it is so simple and so extraordinary. There are some people before being put on this earth that are touched by God and Kishore was one of them! He was made to sing, to perform, to entertain. Music directors even today write songs and music with him in mind, that is his influence! God i wish he was still alive today. Why did you take him? Hey Kishore da we love u lots! many many happy returns of the day, aap sada amar raho. zindagi ke safar mein, gujar jate hain jo makam. many many happy returns of the day….. Wish you a very Happy Birth Day. No doubt Kishore Da is the greatest versetile in the hole universe since begning to end. Kishore Da will always live with all universe like air specially for all indiana. So we are praying from god to send once again in this word as earlier as possible so that the hole indians demanding such type of singer god.